My first apartment! We lived on the top floor. So many memories here. The Food Bloggers of Canada conference began on Friday afternoon, but not before Aimee would take a small group of us on a walking and eating tour of Old Montréal, just steps away from where I had my posh King suite all to myself in Le Westin. We popped into Olive & Gourmando for excellent coffee and this gingerbread white chocolate square I need to replicate. We went somewhere else for caneles and marshmallows, somewhere else for croissant. Horse-drawn carriages on cobblestones and church bells ringing were the background sounds as old friends caught up and new friendships were made. Jenny Jack hugged me so tightly I thought a rib might be cracked. And then she made me laugh so hard I knew that it wasn't. That's the best thing about conferences like this - all the catching up that is done with people you never see. Like a high school reunion, except you actually like the attendees. 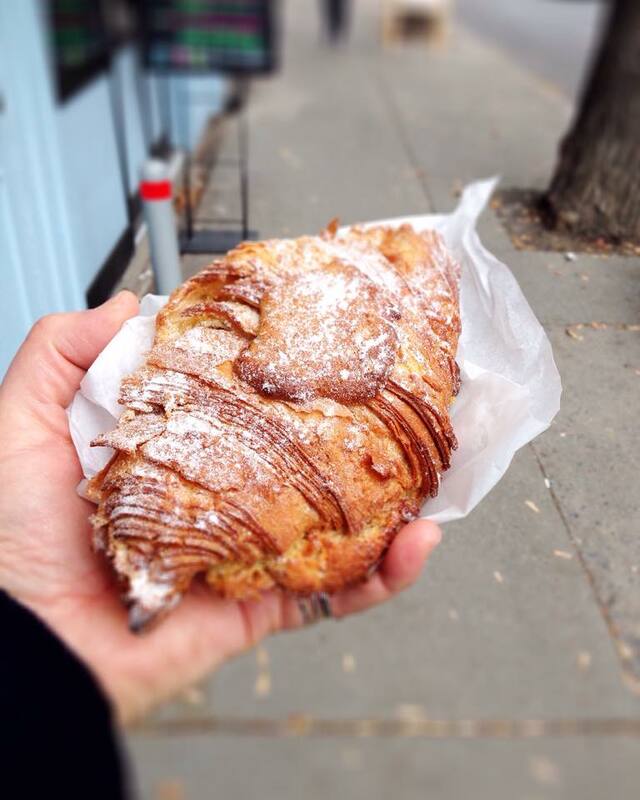 The almond croissant of my dreams, from Mamie Clafoutis. The next couple of days were all about the conference, and the theme this year was Taking a Leap - something I know a little something about. On more than one occasion I've leaped forward into the unknown, either quitting a job or moving to a new place or leaving an undesirable relationship and every single time it was the best thing I could have done. Ricardo, so handsome and so eloquent, gave an inspiring keynote, and one thing that truly resonated with me was when he said that taking leaps and taking chances is in essence the pursuit of happiness. And choose what you want rather than what is "safe". Those are two nuggets of wisdom right there. Just let them sink in for a sec. Quite pleased with myself after climbing Mount Royal. It's like 100 million steps or something. Information was flowing fast and furious - like how I should copyright my content, how I should make my posts so Google will like them more, but my favourite thing was hearing Andrew Scrivani from The New York Times talk about photographing food. Oh my word. I was hanging on all of his. What an inspiration. See, there's that word again. Such a sweet man, too. He tolerated my stalking corralling him in the hallway and asking about cameras. But really I just hoped a little of his magic would rub off on me. And then the most magical thing happened. FBC and Tourism Montréal had a fantastic Instagram contest going all weekend and Grand Prize was a trip for 2 back to Montréal. And guess who won? THIS GIRL!!!! Oh gracious. And guess who was one of the judges? ANDREW SCRIVANI, along with Aimee and the photographer for her cookbooks, Tim. It was a surreal moment - seeing my photo up on the screen to announce the winner. Looks like I'm coming back for you in 2016, Montréal. Here's the part where I get a little mushy. I cannot thank Canadian Lentils and Sask Pulse enough for their generous sponsorship of my participation in FBC2015. They made me feel terribly special and on more than one occasion I had to give myself a little pinch to make sure everything was real. So far this year, so many wonderful opportunities have come my way, and the work I do with Canadian Lentils has been a huge part of it. From the bottom of my heart, thank you thank you thank you. Speaking of lentils, let's talk about this recipe! 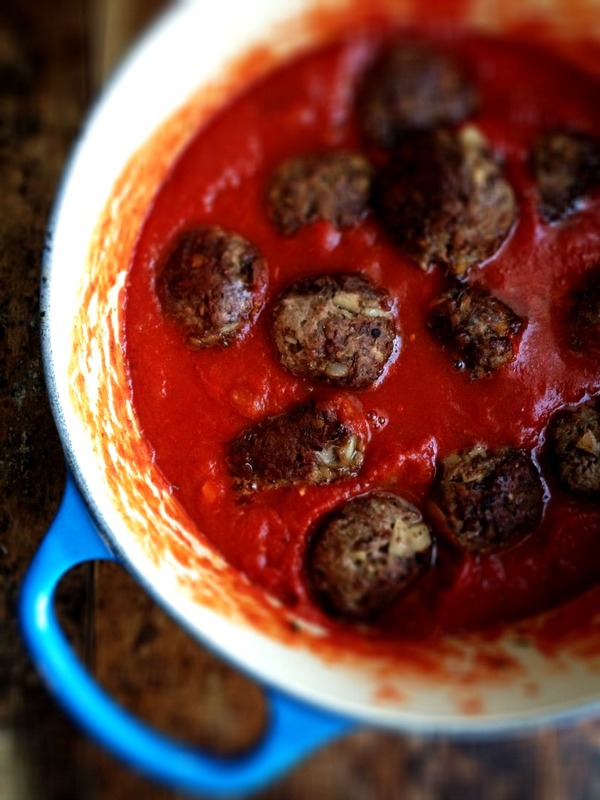 Canadian Lentils wanted me to update their meatball recipe on their website and this is what I came up with. With the ever rising cost of beef in the grocery store, this is a great way to cut it with lentils, and I guarantee you no one will be the wiser. I love how the lentils get crispy on the outside and add a tenderness to the meat. I simply fried the meatballs first then added them to some tomato sauce I had simmering on the stove. They will continue cooking and their lovely juices will be added to the sauce while water boils for pasta. 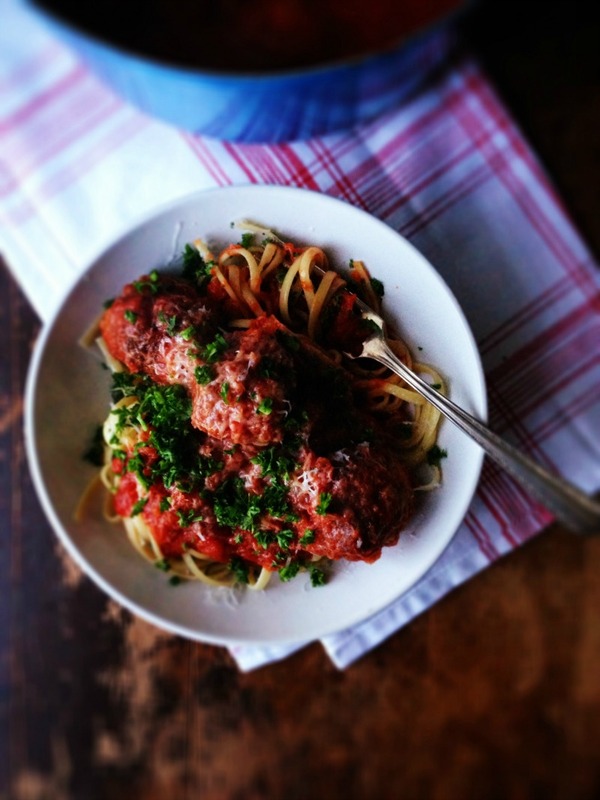 I like making a double batch of meatballs and freezing most of them - great for days when you want a quick supper. Feel free to add them to other sauces as well - mushroom, sweet and sour, you name it. 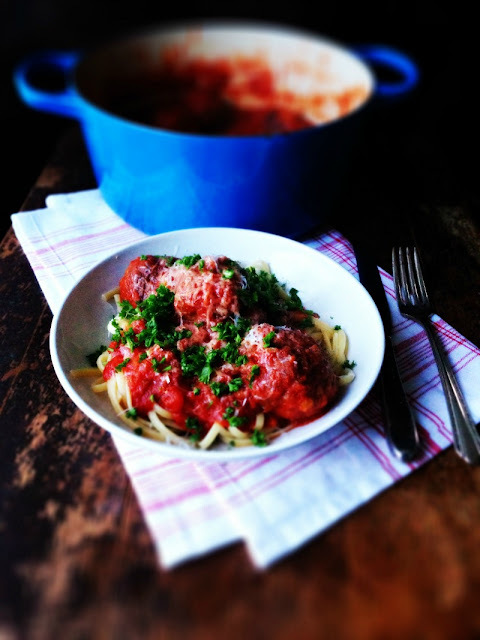 The recipe for the meatballs can be found here. Again, I just fried them and skipped the oven part because they were going to finish in the sauce. Serve with hot linguine or your favourite pasta and garnish with lots of grated Parmesan. Bon Appetit! For more shots of my trip to Montreal, take a peek at my Instagram. There's more food and fun over there! In a Dutch oven, heat the oil over medium high heat. Add the onion and celery. Cook until onion is translucent. Add garlic and rosemary, cooking another 3 minutes until fragrant. Stir in the white wine and let it reduce, about 5 minutes. Stir in the crushed tomatoes, brown sugar, fennel, oregano, salt, pepper and chili flakes. Cover and simmer over medium low heat for 20 minutes. Add the meatballs and simmer another 20 minutes while pasta cooks. Stir in chopped parsley or basil. Serve hot, on top of cooked pasta and garnish with plenty of Parmesan cheese. Serves 4. Can't leave Montréal without eating poutine. This one had bacon and it was glorious. congrats on winning that montreal trip! i can't say i'm surprised; that bagel pic just makes me want to go in and grab one right off the belt!